Osteoarthritis is an unrelenting disease. 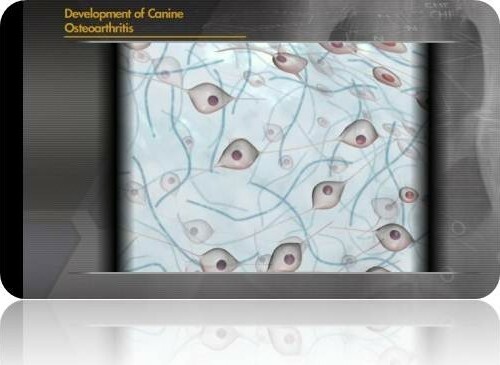 Dynamic forces and destructive enzymes cause joint cartilage to fray and crack; gradually the cartilage is worn away leaving us with bone-on-bone contact and bone-on-bone contact is a very painful condition. It is very difficult to effectively control bone-on-bone pain. 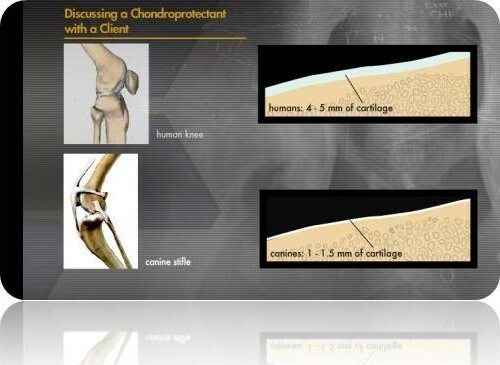 In the human medical field patients with advanced arthritis would face joint replacement surgery. 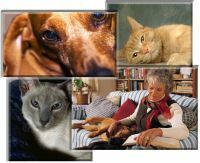 But we are not dealing with a human patient; joint replacement, while it may be an option in some cases, is not remotely an attractive option for the majority of pet owners. The inescapable truth is that articular cartilage MUST be preserved; Once it's gone, it's gone. Osteoarthritic disease must be attacked aggressively at the earliest possible point. OA patients need to see us at the earliest possible time; as soon as OA is detected. Muscle disease (myofascial disease; myopain) is an expected development with any functional disorder and OA is a prime example of that type of disease. Most health care professional completely overlook the crucial role that myofascial disease can play in the generation of chronic pain for the OA patient. Muscle pain isn't obvious unless you are trained to look for it; unless you develop high level muscle pain awareness. It's easy to take an X-ray and point to a diseased joint and declare "there's the problem"; in reality, the joint is just the tip of the iceberg. Has your veterinarians conducted a muscle-by-muscle patient myopain inventory? If not, you are not in the right place. And we're not just talking about muscles attached to the affected joints; you need to look at all the muscles; the muscles away from the affected joints; the ones suffering from compensatory overuse and misuse caused by muscle imbalance. Our recommended OA foundation is based upon optimal weight management, Adequan® (a home based injectable joint protectant/disease modifier given under the skin), and high quality omega fatty acid supplementation. Broad based multimodal pain medications help improve pain relief while minimizing adverse risk exposure. While we do utilize NSAID drugs for healthy OA patients, many of our older OA patients are not well suited to NSAIDs due to kidney, liver, or digestive system intolerance. We have many pain relieving medication options in medication classes that have excellent safety profile for patients with kideney, liver, or digestive system issues. Even when NSAIDs appear well tolerated, the patient must be monitored closely. Physical rehabilitation is crucial to effective patient OA management. Ideally, we include office based modalities (underwater treadmill, e-stim whirlpool, balance balls, wobble boards, cavaletti rails, low level laser therapy, etc), a home exercise program, and a careful home environment review. Needle based therapies are crucial to patient management. Myofascial needle therapy and traditional acupuncture therapy can be the singular reason an OA patient achieves reasonable pain relief. Mesenchymal stem cell therapy (stem cells derived from the patient's own fat) is recommended as a general rule for all OA patients. One of the greatest concerns we have is the late stage at which we so often find ourselves being consulted. 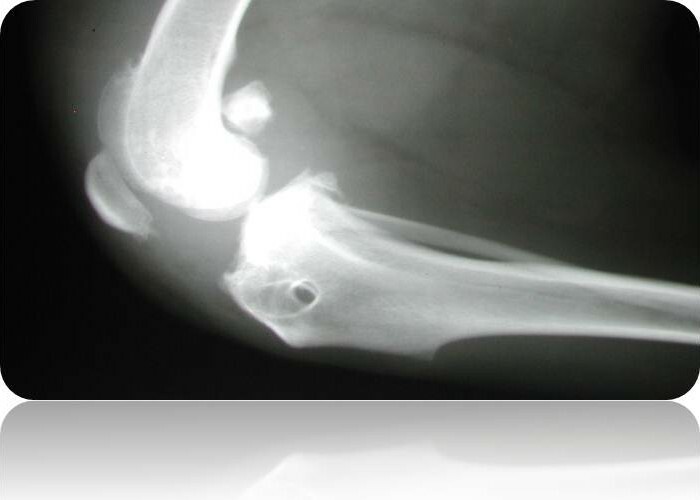 Veterinarians are not always suggesting referrals until the patient is in late stage OA. Mesenchymal stem cell therapy becomes a required step. Intraarticular (IA) hyaluronic acid injections can gain sustained pain relief and improvements in function. Hip denervation may be required to relieve the pain of severe hip OA patients. Acupuncture and herbal therapies can be invaluable for the advanced OA patient. Intraarticular botulinum toxin has been a highly successful pain relieving procedure for human patients with severe OA. When joint replacement surgery is not an option, IA botulinum toxin can provide 6 and more months of pain relief with little to no risk. When the patient's OA pain returns IA botox can be repeated for a predictable additional sustained block of pain relief.